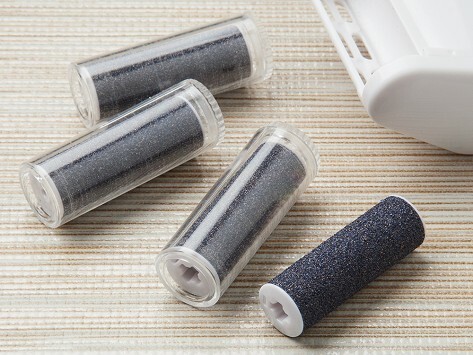 This set of replacement rollers for the Brio SilkStone will help keep your skin silky smooth. Replacement items slide on and off easily. The SilkStone Electric Pedicure File gently buffs away dead skin and calluses in a snap, thanks to a powerful motor and fine-grit surface. Unlike traditional pumice, which requires soaking and manual scrubbing, this electric foot file works on dry skin. You don’t need to prep, you don’t need to be in the shower, and you can even use SilkStone on elbows and hands. The rollers work quickly and safely—reaching contours other files can’t with their small, rounded size. Great for touch ups in between salon trips or just to take your DIY pedicures up a notch, this tool will get your toes in top shape.